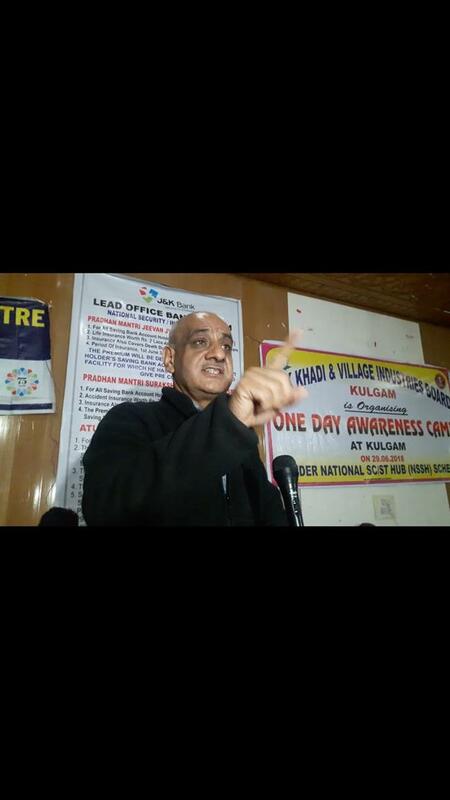 KULGAM June 29: Jammu and Kashmir Khadi and Village Industries Board, Srinagar today organized district level awareness camp regarding National Schedule Cast/ Schedule Tribe hub (NSSH) scheme at Townhall Kulgam. Alaqaband said that for the implementation of this scheme in Jammu and Kashmir, Khadi and Village Industries Board is organizing workshops, awareness programmes, skill development programmes and other mass mobilization programs. Deputy chief executive officer- Muzaffar Alaqaband was chief guest on the occasion. Bee Keeping Officer Abid Alam Shah, Lead District Manager Gh Rasool Mir, District Officer SC-ST Kulgam- Noor Ah Bhatti, AAO employment Mohd Yousuf, District Coordinator SBI-Muzzafar Hussain, District Coordinator JKEDI- Shabir Ahmad, DIC block investigator- Nasrullah Mubarak, Director RSETI- Bashir Ahmad, District officer handicraft, district officer KVIb and other functionaries from line departments. Besides them a large number of people belonging to SC /ST Community were present. Giving details about the scheme, Deputy CEO Muzaffar Allaqaband KVIB said that NSSH is an initiative of the Government of India to develop a supportive ecosystem to focus on the growth of SC-ST Micro Small Medium Enterprises (MSMEs). He said that GoI has formulated Public Procurement Policy for MSMEs in 2012, which states that 20 % of total procurement of goods and services by central ministries, departments and public sector undertakings shall be made from MSMEs and 4 percent of such procurement shall be made from MSME owned by SC-ST entrepreneurs,” he said and added that at present, government procurement from SC-ST enterprises is less than 1 % and this scheme will improve their contribution percentage. He exhorted upon the unemployed youth of SC-ST community to become job providers instead of hankering for government jobs and stressed that the community members must come forward and avail the benefits of various schemes under J&K KVIB for their economical upliftment. Speaking on the occasion, district coordinator SBI Kulgam appreciated the initiative of J&K KVIB and assured full support to potential entrepreneurs of SC ST community. JK bank financial literacy centre coordinator Kulgam encouraged youth to take maximum benefits of the schem under J&K KVIB and urged the youth to set up micro units and become entrepreneurs and once you become entrepreneur you will eventually become job provider he added. Bee Keeping Officer Abid Alam shah said that a cluster programme at HMT for production, packing and marketing of the honey is also coming up shortly and raw material will also be provided at these Cluster centers. Amid rains hundred of members from SC ST community attended the function.